Under the proposed agreement, the county would enter into intergovernmental arrangement with the DeKalb Development Authority to operate the facility as a recreation site for up to 50 years. The authority would then enter into a long-term lease with the YMCA to improve, renovate and operate the South DeKalb YMCA facility. The YMCA will spend the $4.95 million it receives from the sale of the property on the renovation and provide all furniture, fixtures and equipment for the South DeKalb YMCA. It would pay the Development Authority $10,000 for legal fees and $6,187 for its expenses. The Crossroad News article argues that the expansion will expand access to exercise facilities and the contract includes "a waiver of the $100 to $150 joining fees for residents of ZIP codes 30032, 30034 and 30035 for the first 10 years, starting with the commencement date of the lease. It also calls for early program registration times, special program offerings and times for seniors, and financial assistance for families in need." In assessing the public health benefit of this rather sizable County investment, it would be helpful to have access to the data that Commissioners Johnson and Watson are using to project how many more people will in fact use the South DeKalb YMCA. Additionally, such projections need to be weighed against how many hundreds of thousands of DeKalb residents in zip codes 30032, 30034 and 30035 and elsewhere will benefit if these greenspace funds are used per bond referendum guidelines. After all, the physical, mental and social benefits of greenspace are well documented. 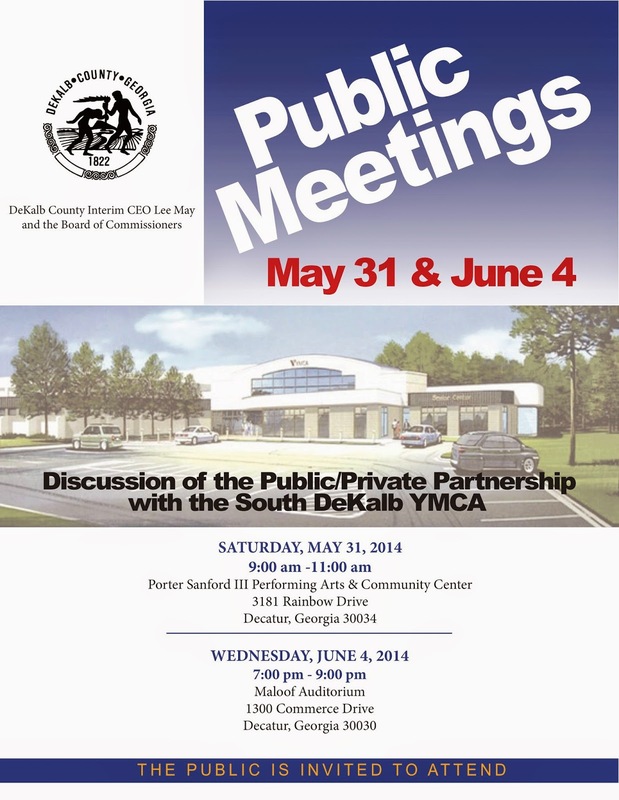 Please attend the June 4 meeting at at the Maloof Auditorium in downtown Decatur if you can. If this announcement is too short-notice for you to do so, please set aside a few minutes to contact our DeKalb Board of Commissioners and share your views. Thanks to Mary Shellman for alerting us to this issue. UPDATE: Next meeting discussing this issue will be as follows. Commissioners Rader and Gannon Community Meeting on the proposed acquisition of South DeKalb YMCA by DeKalb County Government at Tucker Recreation Center 4898 LaVista Road.